Altrincham’s Music Scene – Alive and Well! Greater Manchester is well known for its musical prowess. From Oasis and Joy Division to The Smiths and Take That, we probably live in the most musically talented area of the UK. Thankfully, Altrincham’s live music scene is reflective of the region’s musical history, and holds countless live music nights throughout the town in some of its most popular bars and clubs, as well as its annual Goose Green Music Festival – because…well why not?! Old Market Tavern is a popular pub and music venue featuring amazing live music from performers across the North West. On top of the scheduled live gigs on Fridays, Saturdays and Sundays, Old Market Tavern has an Acoustic Night every Thursday where you can bring your own instruments and join in! With a wide range of Belgian beers, traditional ciders and fine wines, you’re in for a fantastic, toe-tapping night in this Altrincham live music champion. Located in the heart of Goose Green, Altrincham’s hub of quirky bars and fine dining restaurants, the Green Room offers an amazing atmosphere and a night you won’t forget! 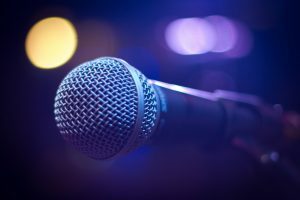 Every Thursday night you can bring out your favourite karaoke classic with the bar’s open mic night, whilst on Fridays you’re treated to the Green Room’s very own house band, The Henry Revue, who are known for putting on unmissable shows. Still not convinced? The Green Room has received a 5* review from Jack Daniels, who have called it “An establishment of the highest order” – how could you resist? Anyone fancy a bit of al fresco dining with their live music? The House Restaurant and Bar has gathered quite the following for their live music acts every week, and the fandom only increases when the sun’s out as you can enjoy drinks and a meal on the sun bathed terrace. If you’re looking for an eclectic mix of music genres, House Restaurant and Bar is the one for you. From live acoustics and natural soul to Motown and pop-rock, there’s something to suit everyone’s taste buds! Altrincham’s live music scene is alive and kicking, offering a fantastic mix of music styles, venues and year round gigs. Music is the heart of Greater Manchester, and Altrincham is making sure it still beats strong. If you fancy being a part of Altrincham and its proud music scene, call us on 0161 929 1500 to enquire about an Altair apartment. Don’t forget to follow us on Twitter, Facebook and Instagram to stay updated with our fantastic development!